Newswire » Useful Info » Are JobPath’s Days Numbered?? 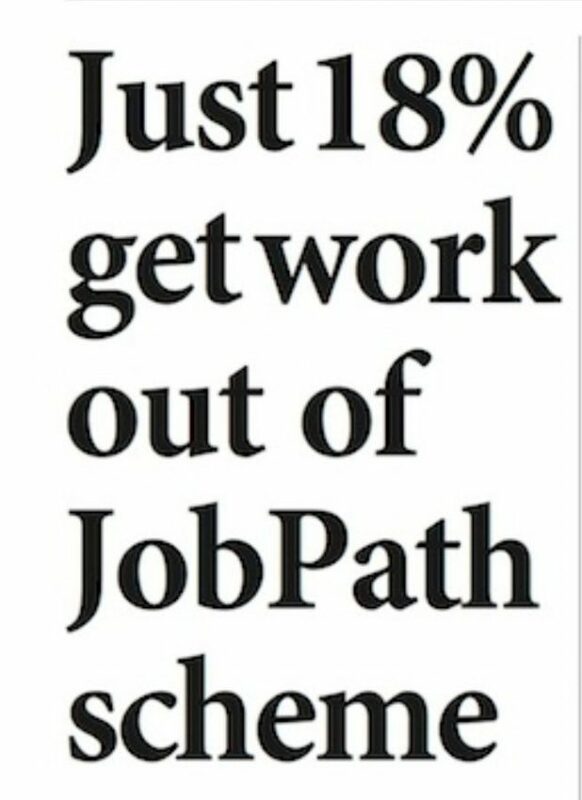 JobPath is called “an employment activation programme” and is intended to help the long-term unemployed to find and retain full-time employment and is provided under the Department of Employment Affairs and Social Protection (DSEAP). Selection for a JobPath placement is supposed to be random for Job Seekers on long-term unemployment and for newly qualified persons who may need intensive support, according to Citizens Information. The job activation work is provided by Turas Nua ( covers the areas of Cork Central; South East; Mid-Leinster, Mid-West; South West; Midlands South) , a partnership with Irish owned FRS Recruitment and U.K. based Working Links and Seetec (West; Midlands North; North East; North West, Dublin Central; Dublin North; Dublin South), a subsidiary of a U.K. company, or those they contract in local areas. Once a jobseeker is placed on JobPath they are asked to sign a contract with the providers, with the normal length of commitment 52 weeks. Clients commit to attending training sessions and appearing for monthly interviews with Personal Employment Advisors. They are expected to report any job applications and the results of their applications and to complete tasks set them by their Personal Employment Advisors. While on JobPath clients can not access CE schemes or other training for career paths without JobPaths release. JobPath is payed primarily when they ‘place’ a person in employment and that person stays through set dates (releasing more payments). Releasing any clients from the contract would mean they will not receive that pay. Clients are told participation is ‘voluntary’. “However, failure to engage with the service may affect a person’s welfare payment. All decisions about client welfare entitlements will be taken by Department officials.” It has been reported that up to €50 a week for 9 weeks may be deducted from social welfare payments if clients refuse to attend JobPath sessions and or training. Questions have been raised on blogs about the legitimacy of the government insisting on job seekers signing a private contract to maintain their social welfare commitments. Searching under ‘JobPath’ reveals a number of long blogs and posts on boards by participants complaining of bullying and false information being provided by JobPath services. Sinn Fein published http://www.sinnfein.ie/files/2017/JobPath_Exposed.pdf, highlighting the experience of some newly qualified teachers among others. I checked with two of the teachers unions. One, while praising the work Sinn Fein has done on this, said they have had no complaints from members about JobPath. The challenge for their new entrants is not being forced on to JobPath but to refuse lucrative contracts in other countries. This is what they believe is causing the critical shortage of supply teachers. They describe recruiters from overseas attending Teacher Training Colleges career days with little or no participation from Irish institutions. The second also said the service has not been referred to their attention. With the revelations of the “success?” of the scheme, members of the Dail’s Public Account Committee are expressing their concern. Catherine Murphy TD said, “I have long had concerns about the quality of the scheme, when you take it with the stories from those who enrolled, but now there are real questions to be asked about the value-for- money aspect,”as reported in The Examiner by Daniel McConnell (www.irishexaminer.com/ireland/just-18-get-work-out-of-jobpath-scheme-466423.html). The Examiner article also quotes Willie O’Dea, Fianna Fáil’s social protection spokesman, has also called for the winding up of the scheme. “We have had huge concerns about this for a long time, I am deeply annoyed that so much money has been going to line the pockets of private operators. “Between the low success rate and the amount of money involved, clearly it is time to wind up the scheme because it is simply not working,” he is quoted in the Examiner article. A full socio-economic review of the scheme is scheduled to be completed in autumn 2018. The Department will not release further information saying that information is commercially sensitive. JobPath is the privatisation of employment support services by the government. It is ignoring the work of the Local Employment Services, Jobs Clubs, Skills to Succeed Academy, Jobs Seekers Pack, Jobs Ireland, and Community Employment schemes that are already in place to support back to work efforts. The reports from the many blogs and board posting speak of JobPath staff that are poorly trained with primarily performance related goals. The vast majority of it’s pay is when it places a client in work of at least 30 hours a week and the client passing 3, 6 and 12 month dates in the job. Taking your skills and building up a CV via part-time work or CE schemes might be the traditional way of improving employment chances. JobPath though is an all or nothing option. The problem is that the all just needs to be a 30 hour a week job a ‘reasonable’ distant from your home for minimum wages for Seetec and Turas Nua to be paid. Unlike the Local Employment Schemes they have no commitment to truly support you in your longterm goals for work or employment. Firstly, I am one who has been refferred to and suffered jobpath a second time. They could not help me the first time around and I hold less hope of them doing so this time around. I have been and continue to seek employment regardless of Jobpath. They do not benefit me in anyway and are of no use to me. I find this to be the case with other people on the jobpath scheme. There is nothing I am doing in Jobpath that could not be done through the welfare service itself. I fear thsi is a trend eminating in the US, spreading through the EU in privatising public services. The jobless are now a commodity to be bought and sold. Prior to the Celtic Tiger vanishing in the crash of 2008, am I not correct in saying that Ireland had what is termed and accepted internationally as full employment at around 4% unemployed? Without the existence of a service like Jobpath. This is proof people want to & will work wthout coercion. As with everything there are always exceptions to the rule. A recent report on TheAvondhu.ie website relating to Cork contained the following ” The most popular jobstarts delivered under jobpath are in the Contact Centre (32%) Construction (20%) and finally hospitality (17%).” I would contend that all of these jobs would have been filled without any assistance or interference from jobpath. Thus making Jobpath pointless. I sincerely hope the oppostion parties dissect the upcoming cost benefit statistics review with that in mind. Get rid as soon as possible. It is demoralising, intrusive and demeaning. I am clearly not a fan. Exactly what Hal Leonard said. I am also being sent back there too. Remove them from the equation and jobs vacancies would be filled at the exact same rate. what a waste of public money. Paying them for a job someone would have got anyway. I would be inclined to agree. I have been on Jobpath since last April and, while the half day and full day courses that are provided are somewhat useful, the whole for profit ethos of the companies operating the scheme are not in the interests of the jobseekers who have to go through the scheme. It should be wound up. Totally agree with Hal Leonard. Jobpath are a demoralising and soul destroying for profit organisation. That use fear and intimidation to get cooperation. And also as said we had full employment in this country when there were jobs. This racket needs to end. it is bad enough being unemployed or working part-time when you want full-time employment without being subjected to Jobpath. After a year on JA i got letters from this private profit-making Company and then calls demanding i attend or get dole cut. I refused, and refused again…i can do what they do by myself without the soul destroying deployed by these money making Brits use to dealing with English ex-criminals…I AM NOT AN ENGLISH EX-OFFENDER. I couldn’t take it and they cut my dole and said after 3-weeks it will be terminated completely. I have applied for hundreds of jobs that even immigrants wouldn’t want, my eyesight is failing and i can’t do some jobs that got me by in past ( eye problems since birth) I’m only 41, and i’m only getting to grips with the mental destruction of growing up in Belfast at the hands of these greedy Brits who want to torture me all over again…people down here have no clue of the reality of that. Next week will be my final payment and then that is it—zero to live on and no family or rich friends. I didn’t Comply so i must die. Seriously though, i feel better about my imminent death because if i had signed my soul away to this British bully firm then i’d be dead inside anyway. I’m still hopeful something will come up within the week but considering i’ve sent over 300 applications in last year and only gty one-interview to a minimum paid job that genuinely couldn’t do safely with my eyesight ( unless you’re completely blind you don’t get, and i’ve never applied for, any sick benefit or the likes)— i’m not that hopeful.